Over the past few years, I've developed quite the little love affair with Nails Inc. It all began during my trip to London back in 2008, when I had some time at Heathrow and decided to get a pedicure at the Nails Inc. station. My life was immediately changed when I discovered the amazingness that is the whole brand -- gorgeous colors, fabulous application and incredible lasting power! In the next couple of weeks, I'll be bringing you swatches of some of the most recent colors and collections! 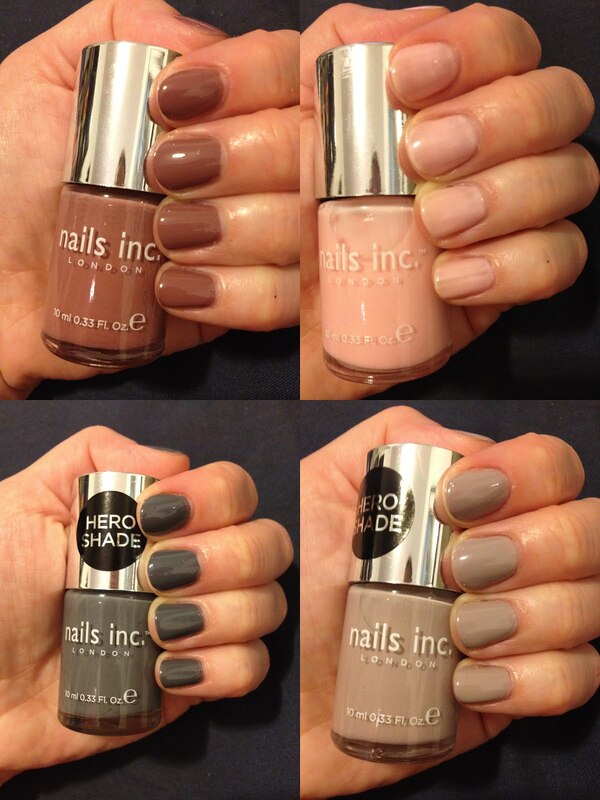 Up first: The Nails Inc. Colour Collection. A shot of the entire collection, in the pretty packaging! Elizabeth Street is a pale, creamy pink. It takes a few coats to build this one to opaque, and it's my least favorite in the collection only because I'm really not a pale pink fan. But if you're a fan of colors like Essie Ballet Slippers or Essie Mademoiselle, this one is for you. Jermyn Street is a creamy, chocolatey taupe. If you're a brown polish fan, this is definitely a good one for you! I think it's pretty unique -- I have a lot of brown nail polishes, and none of them are like this one at all. Completely opaque in two coats. Porchester Square is a taupe-tinged dove grey. Again, very unique and completely opaque in two coats. I like the mushroom/taupe hybrid take on greige here. The Thames is a deep charcoal. Like the others, opaque and creamy in two coats. Definitely a standout from the collection for me. I think it looks a lot like Zoya Kelly, but just a little lighter. A perfect color for fall. Overall, I really liked this collection. Each polish is a different take on the neutral trend, and the application is easy for all four -- no streaks, smudges or goopiness. My two favorites are Porchester Square and The Thames, only because I tend toward grey and taupe nail polishes in general, but all four are extremely pretty. The Nails Inc. Colour Collection retails for $25 at sephora.com. yeah that gray color is unique one!